Happy Friday! 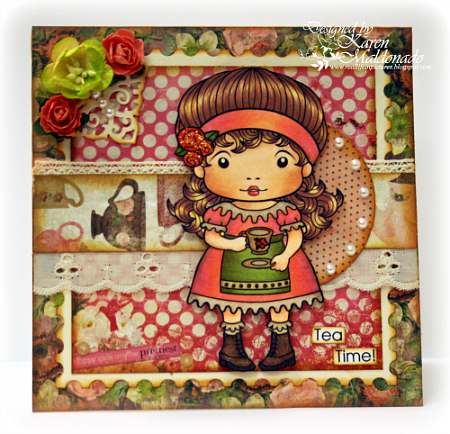 This is Jeanette and it is my turn to share all the wonderful makes from the Friday Team. 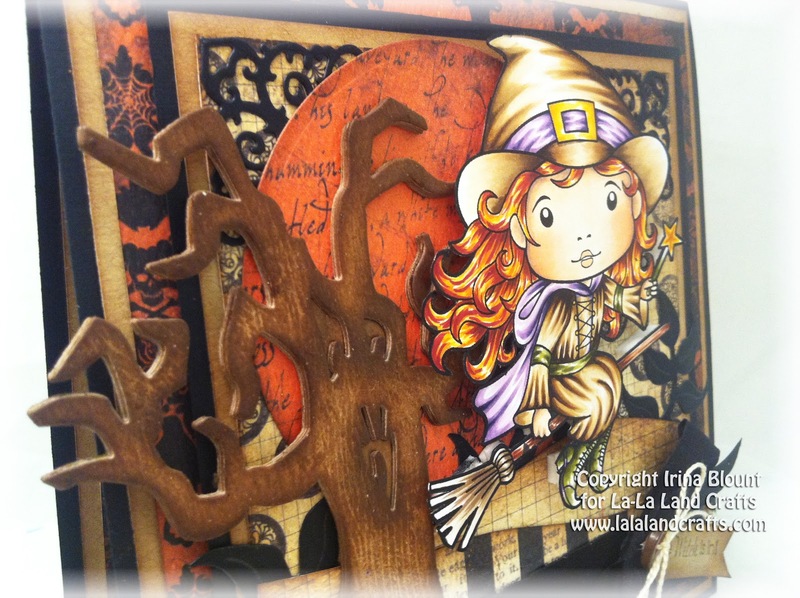 You might want to check out the La-La Land Crafts Company Page and Group page on Facebook, plus we also have a twitter feed too . 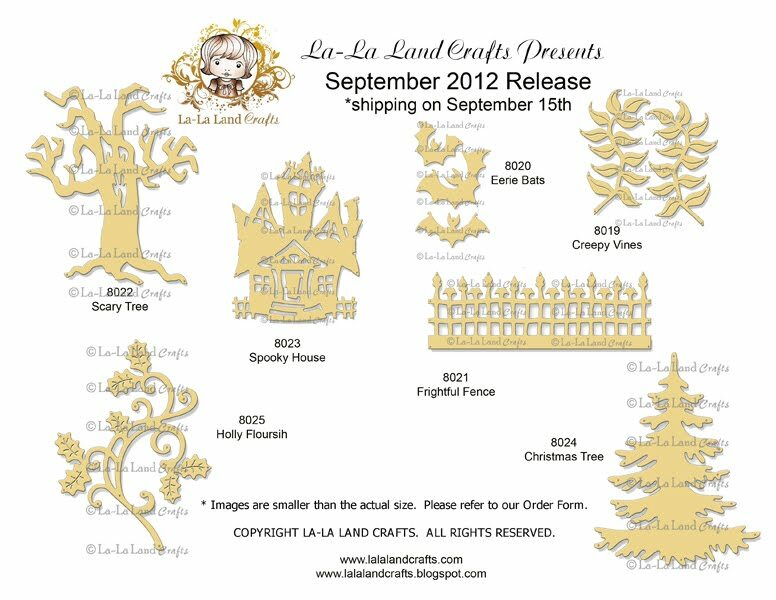 We really love to see your La-La Land Crafts makes so just link them up to the Customer Gallery and be in with a chance to win a prize. 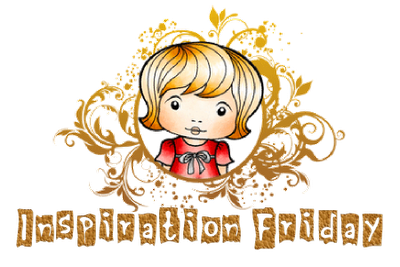 The theme for this weeks Inspirational Monday is..
hair-antique linen,walnut stain , vintage photo , black soot. RV91, RV93, RV95, E71,E74, E77. Well I hope you enjoyed this Monday's showcase and don't forget to pop back on Friday for more inspiration from the Friday team! Good morning and welcome to our special HALLOWEEN/CHRISTMAS New Release Friday Showcase!! 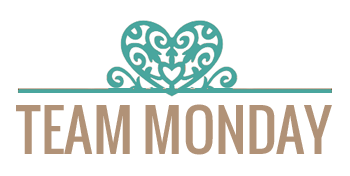 Have you checked out what our AMAZING Team Monday created with these new stamps?? If not, WHY NOT?!! Let me tell you these cuties are AMAZING!! 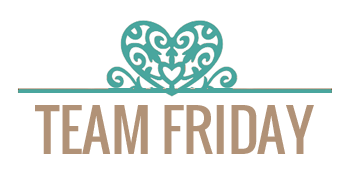 Team Friday pulled out all the stops to bring you another round of INSPIRATIONAL creations to showcase each new product. 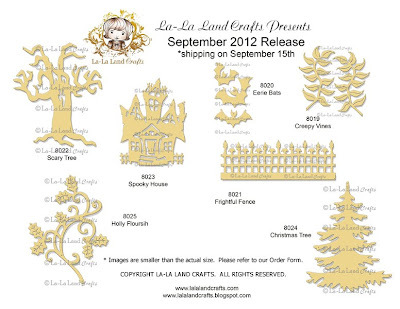 This is our Halloween/Christmas Release of 2012!! 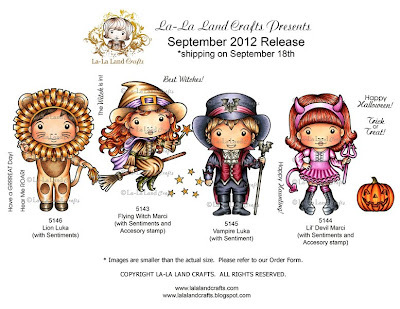 There are 8 new Marci and Luka stamps and 7 new dies in this release. First up, our new Halloween stamps - Lion Luka, Flying Witch Marci, Vampire Luka and Lil' Devil Marci. 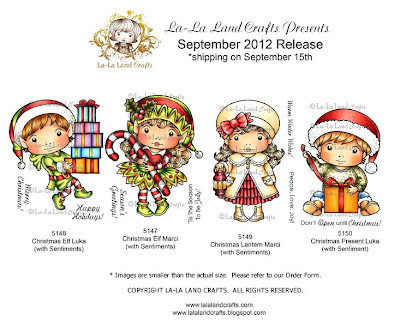 Here are the new Christmas stamps from this release - Christmas Elf Luka, Christmas Elf Marci, Christmas Lantern Marci and Christmas Present Luka. Next up are the new dies! 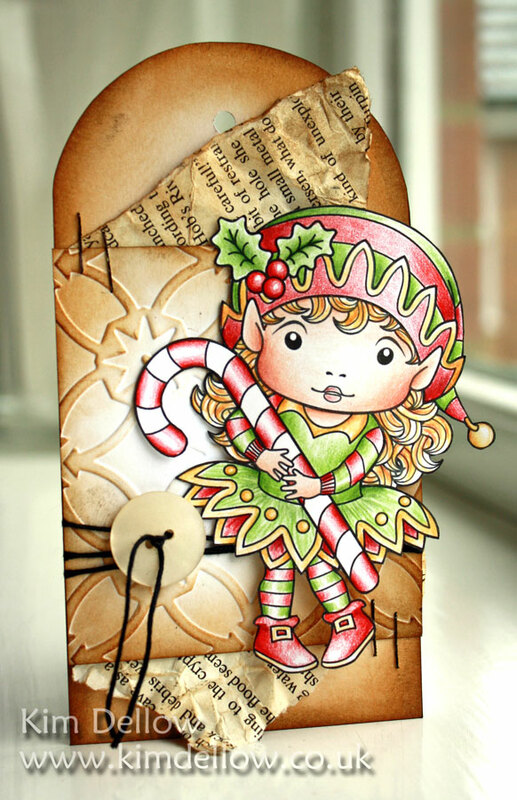 With the addition of the new dies, the possibilities for your holiday projects are endless! We also have 2 new Christmas themed dies - Christmas Tree and Holly Flourish. Important! These items are not available to ship to Australia directly from our online store. If you are in Australia, please contact your local craft store to purchase. If you need help locating a local store, please email X-Press Copic Australia at jacqui@xpressgraphx.com.au for assistance. 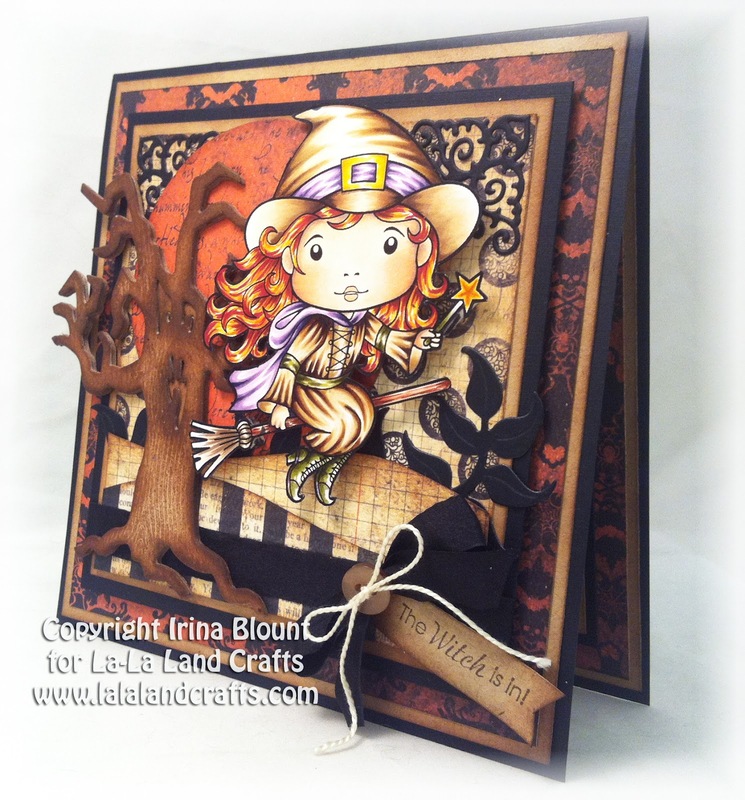 Our Debbie went wild and created FOUR cards!! 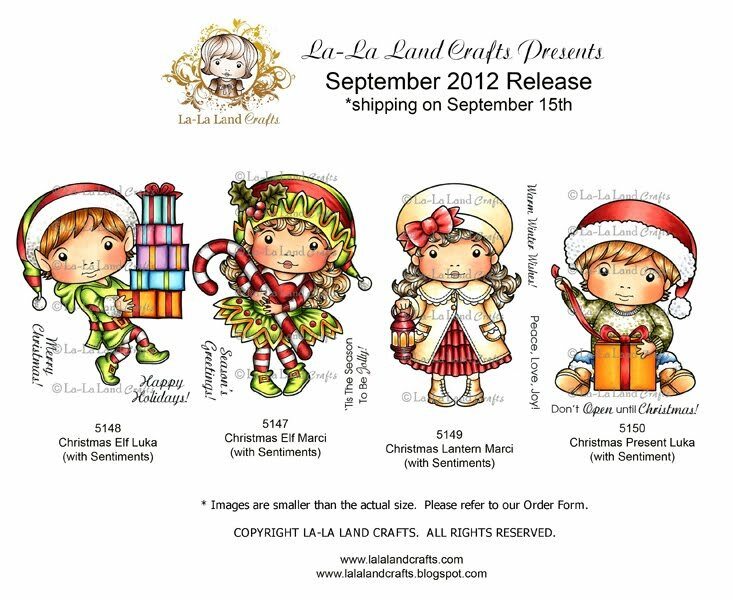 Don't forget to head on over to the La-La Land Crafts Store to pick up all these fabulous stamps and dies for your Holiday creating! We can't wait to see what you make with them!! Have a great week and see ya back here soon! The Witch is in! I made a card with a few products from our new release today. The front of my card features Flying Witch Marci, Scary Tree die and Creepy Vines die. Sentiment is included with Flying Witch Marci stamp. I cut 4 layers of Scary Tree out of thin chipboard. Removed eyes and mouth from the top two and left them in the bottom two, really love the depth! 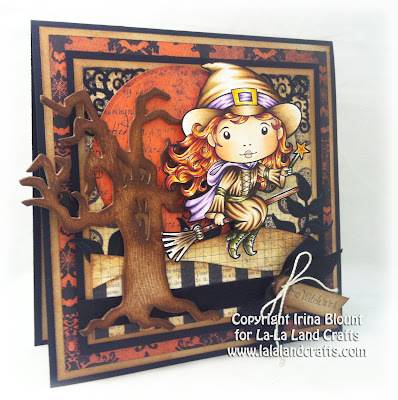 I inked all the layers with Vintage Photo Distress Ink and then stamped woodgrain texture in Walnut Stain. 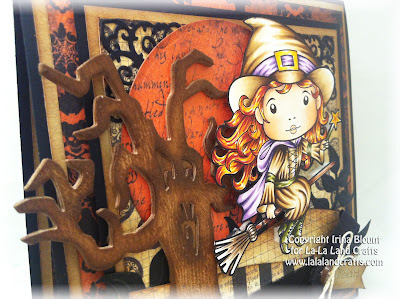 I stamped another Flying Witch Marci image inside of my card, this one was stamped with Walnut Stain Distress Ink. Sentiment inside of the card is from Vampire Luka stamp. You can see I also have our Eerie Bats here, there are 3 bats in this set - all different sizes and styles! Happy Halloween - Lil' Devil Marci! 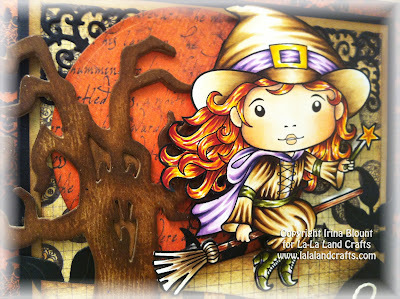 Here is my card with one of our stamps from the NEW Halloween Release - this is our Lil' Devil Marci! I kept my card simple and let the gorgeous papers, the image and the dies take a stage. I used both flourishes from our Creepy Vines Die. It's so nice to have two that are a mirror image of each other! Marci and the whole front panel are raised on foam tape, gives the card more dimension. This is what I did inside of my card. I used our Frightful Fence Die and one of the bats from Eerie Bats Die set. 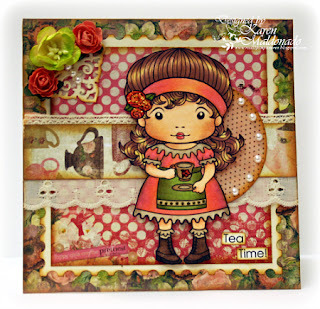 Sentiment is included with Lil' Devil Marci stamp! I actually really love how the inside of the cards turned out. I think it would make a nice simple Halloween card on it's own! 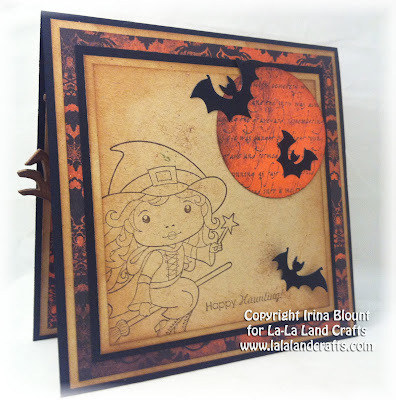 Halloween & Christmas NEW RELEASE!! OWH - We Salute You!